BILLINGS, MT--(Marketwired - December 09, 2015) - Jefferson Bus Lines will be hosting a grand opening ceremony this Friday, December 11th for its recently remodeled bus station in Billings, MT. The new building is located in downtown Billings at 1830 4th Avenue North and includes a 13,482 sq. ft. building on over 2.5 acres. "The new spacious facility is an opportunity for us to showcase all that Jefferson Lines has to offer, including a host of passenger amenities like complementary Wi-Fi, children's area, arcade games, concessions and state of the art real-time arrival and departure display. The facility also helps us launch our charter services in Montana for organizations like schools, businesses and churches looking for group transportation solutions in Montana. These combined improvements will result in a better customer experience," said Kevin Pursey, Director of Marketing for Jefferson Lines. The grand opening will be from 10:00am to 11:00am and open to the public. There will be a variety of activities and prizes for guests including Jefferson swag and free bus tickets. 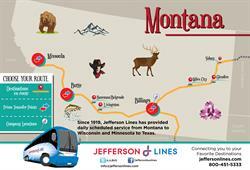 Not only that, in honor of their new Montana charter services, they'll be giving away an entire bus! A charter bus, that is, for a full day. Don't miss your chance to experience Jefferson Lines with your very own bus! The new Billings bus station will continue to provide all the same services of daily bus schedules, ticket sales, package express, and now charter services. The building will be ADA accessible as is with all Jefferson Lines buses and facilities. To contact the current Billings station directly, please call 406-245-5116. For questions regarding the new facility or grand opening, please contact Kevin Pursey at kpursey@jeffersonlines.com. For detailed schedule and fare information about Jefferson's routes, visit www.jeffersonlines.com or call toll free 800-451-5333. Also, be sure to follow Jefferson Lines online at facebook.com/JeffersonBusLines or on Twitter @JLBUS. 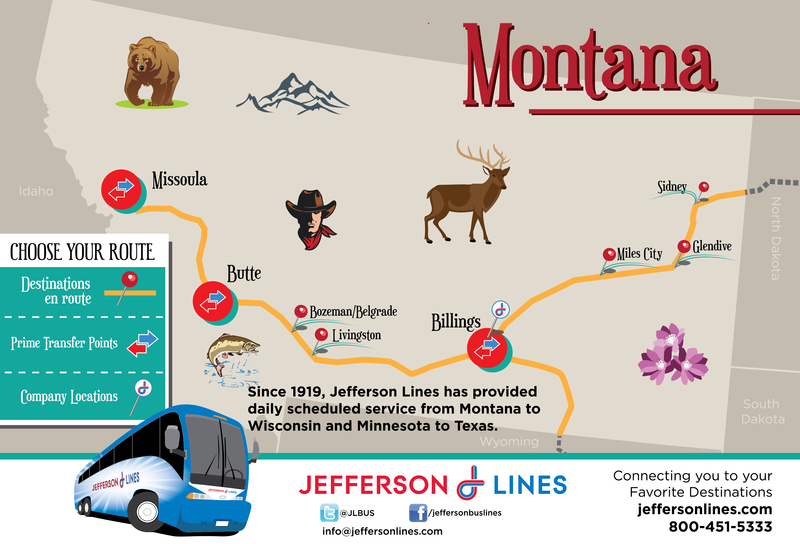 Founded in 1919, Jefferson Lines provides cross-state transportation throughout central United States. Our area of service expands over 13 states from Wisconsin to Montana and Minnesota to Texas, serving over 160 communities nationwide. Jefferson Lines provides direct connections to thousands of destinations in the U.S., Canada, and Mexico.